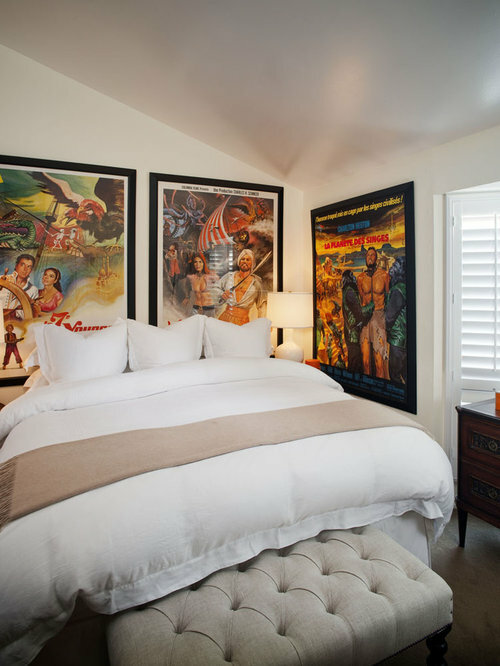 Interior Decorating Ideas: Film Posters. It's all settled: the security deposit, my first month of rent, the first big Ikea trip and the choosing of all the basic furniture (and making the bill at the end, yikes). All done, and so I thought it was time to start thinking about the details: decorating. Since I am such a huge film buff, it seems pretty logical to me (and to my friends, I suspect) that this aspect of my character would be kind of obvious when you walked into my apartment. How you decorate can say so much about a person, and there's nothing like a couple of film posters to do just that for me. I've rounded up a couple of pin-worthy ideas, let's take a look! My Aunt and Uncle had this huge wall full of movie posters in the stair hall of their old home. It was covered from bottom to top, and I just loved spotting new ones as I went up the stairs every time I stayed over. My own room was full of posters when I was a teenager, as well, just stuck to the walls with some nasty sticky thing I grew to regret as I got older, but I loved how old school those things were, and how they transformed a perfectly normal room into something very characteristic. Whereas I'm definitely a fan of neatly framing them up now, I still feel like there's nothing wrong with having a lot of them, as long as they're arranged in an awesome way like in the picture on the right. I don't really think there's a big rule about where you should hang these cinematic frames, do you? That's what I love about them. From your living room to your bedroom, and even the dining space: they'll brighten up every place imaginable. You can even keep it quite fitting: a Jaws poster on the wall right next to your bath tub, how cool would that be? Sources // one, two, three, four. Just set them on top of a cabinet or the floor, even. Still looks darn good. Thank goodness for that, because my future apartment mostly has kind of a sturdy (understatement; it's pure stone) wall. What's more: you can move them around whenever you please without going through a lot of fuss to hang them all up again. SCORE. Honestly, there's so many options to choose from when you pick out a poster. You can keep it traditional and go for the originals (like I think I will), or you could go minimalistic, like these Star Wars posters. A lot of artists make them and you can totally find some online if you want. Just look up Minimalistic Movie Posters on Pinterest and you're off! I'm making a wish list of my personal favourite, must-have film posters for next week's Fiction Friday, but in the meantime: which ones would you like to hang up at your own place? Let me know in the comments below, perhaps we'll have some in common!